Motherhood is a land of fatigue, devotion, kindness, self-sacrifice and ultimately, love. We've searched high and low for unique and beautiful gift ideas that will be pleasing to mothers who really do deserve recognition for their tireless dedication. Perhaps the mother in your life knows the land of motherhood like the back of her hand, or maybe she is entering it for the very first time. Either way, it is time to say 'thank you' on the 11th March by treating mums to a little relaxation and a whole lot of celebration. We hope you enjoy the round-up, please let us know if you've discovered any other wonderful gems around Mayfair this month, we'd love to hear about them. "The Fan" candle by Sophie James has a fresh, cool translucent fragrance of spring lilies, freesia and jasmin, gently lifted by lemons, grapefruits and a hint of bergamot. All resting on a clean, pure base of musk, precious woods, amber and dried fruit. The vessel of this limited edition candle is beautifully decorated in 21-carat gold stripes, and comes in an elegant, soft pink box making it the perfect gift for mothers day. This 220g candle burns cleanly for up to 60 hours and retails at £55. All the candles from the Sophie James range are hand-poured using 100% soy wax and infused with the finest fragrances, to bring a delightful, long-lasting scent and atmosphere to any room. This translucent, delicate and romantic is described as 'a renewal of innocence and the first bloom of love', paying homage to our earliest notions of romance: delicate and dreamlike. From their creative workshop in the French countryside, Perfumer Oliver Creed and his son, Erwin, chose First Love Gardenias, which only grow in pairs. Next: Double Blush Roses, lavender, peonies and pink berries, for a graceful accord. The result is a perfect union of past and future Creed generations, a story in a bottle that captures a portrait of how love once was and how it can be again. Perfect for Mother's Day! Please click here to purchase online or visit the flagship store on Mayfair's Mount Street. Why not treat your mum to a luxury Charles Heidsieck champagne tasting on 13th March? The great thing about this gift idea is that you can join her for the experience - cheers! Charles Heidsieck founded his eponymous maison in 1851. Nowadays, Charles Heidsieck are known their excellent non-vintage blends & their superb vintage wines, with Blanc de Millénaires being one of the stand out bottlings. Hedonism Wines welcomes Willem Pinçon to the store to host this superb tasting. Willem will discuss the past, present and future of Charles Heidsieck and guide guests through a flight of Champagnes including Brut NV, Rosé NV, Brut 2005, Rosé 2005, Blanc des Millénaires 2004 & two mystery vintages from the 1990s & 1980s. Champagne level: Expert. The event will be held on Tuesday, 13th March 2018, 6.30 - 8.30pm at Hedonism Wines on Davies Street. Tickets are £75, with £25 redeemable against any purchase of Charles Heidsieck Champagne on the evening. Please click here for tickets. Filled to the brim with an abundance of Fortnum’s gifts, our Mother’s Day Hamper has everything your mum could wish for – from our delicately aromatic teas to decorative tea accessories and our delicious hand-iced biscuits and delectable jars of preserves and marmalades. All this and more are waiting to be opened and enjoyed within. Please click here to purchase online or visit the store to collect in person. This Greeting Card is from Roger La Borde's Swans range, designed by Emily Isabella. The illustrative scene depicts an ideal day in the life of a relaxed mother: birds twittering merrily outside the peaceful cottage window, fresh peonies and roses in a 1960s patterned vase, a golden medal for being the #1 mum, freshly painted shiny red nails, breakfast in bed with fine bone china, perfectly ripe strawberries and a totally relaxing bubble bath in a Victorian replica free-standing bath. What more could a girl want? Bliss. Pop into the Hatchard's Piccadilly store or please click here to purchase online. Send with a loving kiss. Gone are the days when working women have to wear stilettos to the office, dinner date or ball, thanks to Mayfair's much-loved store, Pretty Ballerinas. Making it acceptable and even admirable to wear flats, Pretty Ballerinas is responsible for the creation of some of the best-looking flats in England. The Ella loafers are high fronted ballerina slippers created in black suede, with a pointed toe and an eye-catching Swarovski brooch. Practical and comfortable, these loafers have leather soles and a textile lining - perfect for that moment when the toddler breaks free or for sprinting after a stray black cab. A great day-to-night pair here - so there is no need to change footwear between the school run and the dinner date. Please click here to purchase online or visit the delightful Mayfair store at 34 Brook Street. From The Bruton Collection, the attractive Bruton Envelope Purse in 'petal' features a textured calfskin with silver-tone hardware, closing with a snap fastening. This 'quintessentially Mayfair' purse includes functional multi compartments to fit notes, with multiple card slots as well as an internal zip compartment. William & Son has a particular and definitively British take on the finest things in life, with craft and craftsmanship at the heart of everything they do. This beautiful purse is a keepsake piece, ideal for everyday use for mums on the go. Click here to buy online or as the name of the purse suggests, visit the store on Mayfair's Bruton Street. Diamond's are a girl's best friend! These stunning diamond chandelier earrings are perfect for mums with a penchant for dancing and the Golden Age Hollywood glamour. For over five decades, royalty and international collectors have composed the clientele of the esteemed British jewellery brand which David Morris established in 1962. Jeremy Morris has since followed in his father’s footsteps and is now managing director and principal designer of David Morris. From within the elegant New Bond Street atelier, in the heart of London, beautiful couture jewellery is hand crafted to the highest standards using only the finest stones to ensure each unique piece is a work of art. David Morris jewellery can be handed down from generation to generation, designed to make a statement time and time again. Click here to make an enquiry online or visit the New Bond Street shop. In the latest body of work by author and photographer Claiborne Swanson Frank, the artist set out to explore what modern motherhood means in the 21st century. Turning her lens on 70 iconic families of mothers and children from such celebrated names as Del na Figueras, Carolina Herrera, Lauren Santo Domingo, Anne Vyalitsyna, Aerin Lauder, and Patti Hansen, Swanson Frank’s stunning portraits capture the emotional bonds and beauty that frame the primal relationship of a mother and her child. Complementing her work is a series of questions-and-answers, in which Swanson Frank delicately tasks each mother to look within themselves and express what being a mother truly means to them. Their answers, while exceedingly thoughtful and introspective, are also amusing, fascinating, and moving. Each one of these deeply intimate and stunning portraits will captivate and inspire readers as they embark on this profound journey that reminds us all of the power of motherhood and the great gift of love. Available for pre-order here, or ask for information at Assouline, Piccadilly. This Mayfair-themed showstopper is guaranteed to provoke a joyous 'gasp' moment from any lucky mum! 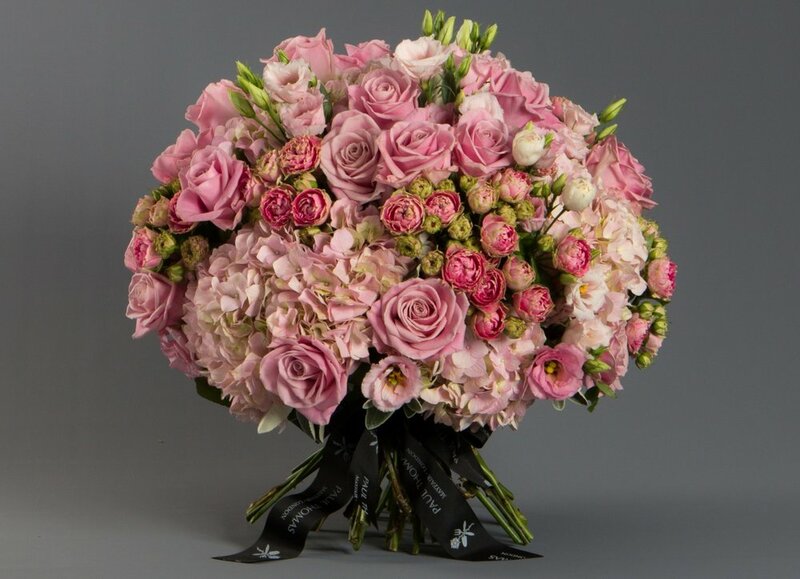 The Burlington is a pretty all-pink luxury bouquet made with flowers such as hydrangea, roses, lisianthus, spray roses and seasonal foliage - perfect for spring. The team at Paul Thomas Flowers buy and work with the very best flowers, plants and foliages that each season has to offer. Click here to buy online or visit the shop on Queenstown Road. Happy Mother's Day from The Mayfair Musings!